- 30 % better Rth value (thermal resistance) compared to conventional modules with soldered chips and isolation by aluminium oxyde. New design of the base plate: modules with suffix T and T1 in the standard outline use the new developed TMS "Thick Metal Substrate", a special Si3N4 ceramic insulation leading to a Rth 50% less than competition! All transistor and diode chips are sintered, so that the formerly obligatory solder layer under the chip falls apart. By that the endurance against thermal fatige and solder crack raises by factor 10. Also improved were the performance of the transistor and the losses of the free wheeling diodes, so that Mitsubishi shrinked the outlines and the weight of the modules compared to the predecessor series. All shown module types can be ordered optionally with preapplied thermal interface material (TIM). This version is marked with suffix "#330G" behind the type name. For parallel use of T-series modules, the parts should be selected for Vcesat. Differently from former series, Mitsubishi supports this task in all 7th generation parts by a selection in a very narrow Vcesat range, so that all of these selected modules can be used in parallel without worries. Those modules you order using the suffix -#301G (or -#331G for the TIM version). For the T-series Mitsubishi has redesigned the NX housing: Instead of soft silicone sealing compound and a plastic cover on top, now the complete area on top of the chips is grouted by a special resin, which is hardening to a massive plate. This lid will hermetically seal the chips and makes the module extremely robust and resistant against torsion. Further advantage: The bond wires on the chips are tied to their initial position. Bond wire lift-off is impossible - the NX-T modules of Mitsubishi are setting a new standard in the field of durability and robustness. NX housing modules are available with pressfit pins: "P" in the middle of the type name marks the "pressfit"-version, that means specially designed pins for being pressed into the holes of the printed circuit board coming on top. Like the standard modules also all NX housing modules are available with thermal interfaxe material (TIM) on request. The TIM version has the suffix "#330G" in the end of the type name. For a surcharge in price also the NX-T modules can be ordered for parallel use. Then a special narrow selection of the Vcesat range will be selected. You will recognize these modules for parallel use by their suffix -#301G (or -#331G for Vcesat selected TIM modules). NX6 sets the standard in 17 mm housing, and with 6th generation IGBT chips inside. For general technical information please refer to the application notes. For technical information about paralleling these modules, Mitsubishi offers the handbook for parallel use of A-Series. Very good Vce-sat values and reduced costs in comparison to the H-series. As the housings of the NF series are equivalent to the older H-series, those newer modules can be used as a drop in exchange type. We recommend to switch to the NF-series when you are using the standard-modules of the H-series yet. 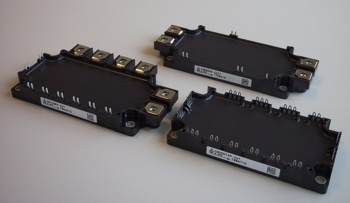 Normal power IGBT modules will not work properly with frequencies higher than 30.000 Hz. The NFH-series is your link to frequencies up to 60.000 Hz. For the NFH-series only dual-modules are available. E3 series for brake systems. KA series with local life time control ICs and an isolation class of 3500V AC. Datasheet missing? Please send your request by email - we will try to send the datasheet in return. H-series was for long time setting the standards for IGBT (insulated gate bipolar transistor) applications. 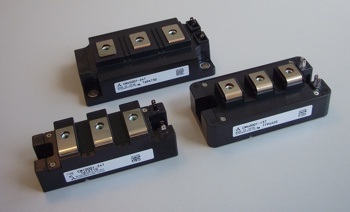 These 3. generation IGBT parts are still available, but for new designs we suggest to switch to NF or NX6 series. CIB modules with integrated inverter, converter & brake for AC/DC-motor and server control applications (type MD). CI modules come without brake (types MD1 & MD3). IGBT modules designed with built-in control circuits and protection against short circuit, over current, over temperature and under voltage. In the beginning of year 2018 Mitsubishihas launched the G1 series in Europe. All modules shrinked in size compared to the previous L1/S1 series, which will still be produced parallelly. The pin layout and the dimension of the connector plug strip was not changed and is fully compatible to Mitsubishi's previous L and L1 IPMs. Newly released were the straight terminal versions. All former IPMs were L-shaped; that means that the the power terminals for N and P were placed on the small side of the module. For customers who want only access to one (the longer side) of the module the new straight pin layout may be helpful. With installing of full gate CSTBT-chips, Mitsubishi lowered the voltage drop of the 1200 volt modules once again. The typical Vce-sat voltage lowers to 1,75 Volts. Additional Mitsubishi offeres two new housing types (CS1D and RL1C). Price of L1-series modules are slightly lower than of L-series. We recommend to our customers to change to that new type, which should be easily realizable.. 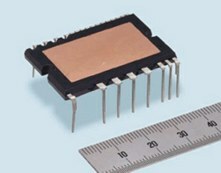 The L-series implements Carrier Stored Trench Bipolar Transistor chips, granting very low Vce-sat-values (typical 1,5 V for 600V and 1,9 V for 1200V). On-chip temperature sensor for all CSTBT-chips, reduced package sizes and more powerful chopper diode for higher brake current. In 2008 Mitsubishi introduced the follow up product family named L1-series with once more lower Vce-sat value. The new L1 series is normally usable as a drop in replacment of the older L-series. *CLB/RLB-types come with solder pins, CLA/RLA-types with screw connections for the DC and AC-terminals. For further information please download here the L series application handbook. Mitubishi's new V1 series Intelligent power modules combine the IGBts in dual configuration allowing the engineer to build up either 4 pulse or 6 pulse bridges. The connectors for the control pins are compatible to older 2in1 IPMs. Grace to the monolithic integrated temperature sensor right on the IGBT chip, the V1 series provides a very precise over temperature switch off. This technology is far superior compared to other manufacturers protecting their modules only with a NTC on the base plate. Mitsubishi offers special photovoltaic modules with 50 and 75 A power rating. Available are three different housings (A, B and C). Functionally the PV series offers versions with inverter only (B4), chopper + inverter (B5) and a module with inverter and 2 choppers (B6). 'A' housing with screw terminals, 'B'-housing with soldering pins, 'C'-housing with small footprint. Due to the lower losses of L1 chips the C version PV modules can use the small housing which was tried and approved already in the L1 standard IPM series under the name "S1 housing". New standard series is L (and L1) series. Lower internal inductance than S-series, modified characteristics of free wheeling diode, partly reduced costs. Like S-series also the V-series is not recommended for new designs.. Using 4th generation planar IGBT chip structure and 1ym design. Not for new designs. We suggest to use the newer L-series instead. *The CBS-types come with temperature sensors on every single chip. They will be only available on demand. Difference between SD and SE: CSD/RSD modules keep the layout and position of the terminals from the s-series, whereas CSE/RSE modules come with optimized terminals (16 pins instead of 19). Ultra compact transfer mold packages include driver and protection ICs. PS20341-G PS20351-G PS21342-G PS21352-G PS21343-G PS21353-G "G" = first edition. "N" - types come with reduced noise level (2nd edition). The third generation comes with CSTBT chip technologie and 0,6 ym planar chips. Using the same housings than the 2nd generation, the better Vce-sat performance allows modules with higher currents. The size reduction of the CSTBT-chips allows more power with less silicium surface - as long as the cooling keeps pace with the needed power dissipation. So in the 4th generation Mitsubishi concentrated on optimizing the dual inline package IPMs towards significantly better thermal resistance (Rth j-c), realized by a layer of resin. That setup allows much smaller housings of the modules and as a side effect also a better isolation: 600 V-Mini-DIPs have now a Viso of either 1500 V or 2500 V, depending of the housing type. Datasheets on request. ** modules PS21993-x, PS21994-x und PS21997-x with lower loss full-gate CSTBT-chips. Mitsubishi implemented in their 5th generation of dual inline package intelligent power modules consequently the new CSTBT chips into the market proven "Super Mini DIP" housing. The 5th generation DIP-IPMs focus on small power drives like in air conditioners, washing machines and other white goods. and Isahaya Electronics.. Heat sinks, assembly components and capacitors complete our product range for the power electronic sector.